In this paper, we use data from the National Longitudinal Survey of Youth (NLSY) to estimate the effects of income, maternal employment, family structure, and public policies on several measures of children’s living arrangements. We use both linear probability models and discrete-time event history models to explore the effects of these factors on: (1) the probability that a child is living out-of-home in a given year; (2) the probability that a child is removed from home in a given year, conditional on the child living at home in the previous year; (3) the probability that a child is removed from home for the first time; (4) the probability that a child is reunified with his/her biological parent(s) given that the child was living out-of-home in the previous year. We also analyze whether these estimates differ by types of out-of-home placements. Our results suggest that children from lower-income, single-mother, and mother–partner families are considerably more likely both to be living out-of-home and to be removed from home. A change in family structure also tends to place a child at higher risk of an out-of-home living arrangement, unless this transition functions to bring a child’s father back into the household. 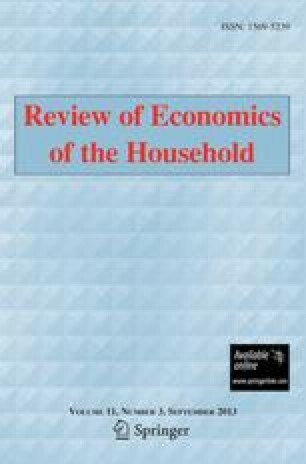 Maternal work appears to increase the probability that a child lives at home. Additionally, once a removal has taken place, we do not find a relationship between income and the probability of a family reunification, but we do find that single-mother and mother–partner families are less likely to reunify. Finally, our analyses provide some evidence that welfare benefit levels are negatively related to out-of-home placements. Funding for this project was provided the National Institute of Child Health and Human Development through grant number 5 F32 HD044 302-02. We are grateful to Shoshana Grossbard-Shechtman, Jennifer Hill, Sanders Korenman, Leonard Lopoo, Katherine Magnuson, and Christina Paxson for their excellent comments and advice.